As of GA4 v4.017 (a free update for GA4) there are now various options to help you respect your customers wishes in regards to communications from within GA4, however, whilst the options may help, in no way do they guarantee compliance in any form or manner to any regulations or laws that may be applicable. 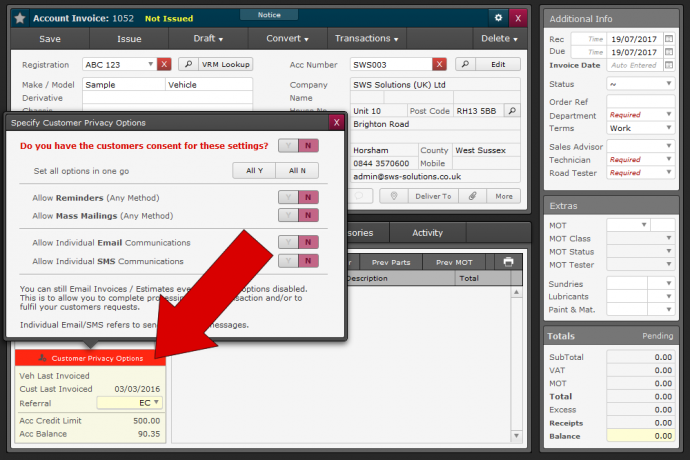 On the right hand side, you will see four default options that will be applied to each new customer added. These have no effect on existing customers in your database. By default, we highly recommend these all be set to N, to ensure you are asking your customer for their preference on receiving communications from yourselves. The privacy options are individually stored against each customer, allowing you to tailor the system for each individual based on their requirements and preferences. We have separated the options, so you have more control. Rather than simply denying all communications, you can discuss with your customer as to which type they are happy to accept, for example: Your customer may be happy to receive an annual MOT reminder, but may not want any marketing / promotional emails (mass mailings). To allow you to make use of these options effectively, without taking up too much time, they are available from multiple areas of GA4, depending on how you use the system. On the document screen, the colour of the bar will change to give an indication of the options and whether or not attention is required. If it's grey, then you have told GA4 that you have confirmed the settings with the customer. Do you have the customers consent for these settings? This is essentially an indicator for your own internal use, it is there so that you can see if you have previously agreed the privacy settings with your customer, other than being a visual indicator that you have asked your customer, it has no impact on how GA4 operates. This is especially useful when you have multiple staff members using the system. If the option is set to Yes, whomever is using the system will know that the settings, whatever they may be, have been agreed with the customer. If set to No, then the customer should be asked and the options set accordingly. 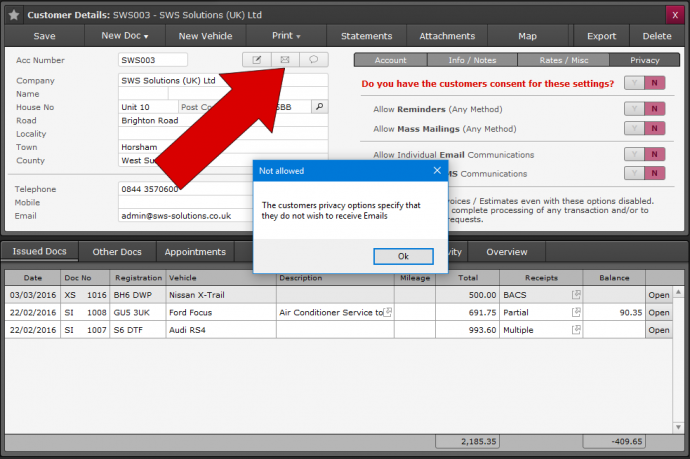 With this option set to N, you will not be able to create or send any vehicle reminders for that customer, such as MOT / Service Reminders. Whilst It is possible to create a vehicle reminder before selecting the customer, once the customer is showing as the vehicle owner, even if a reminder is set, it will be ignored and will not be sent by any of the methods available. 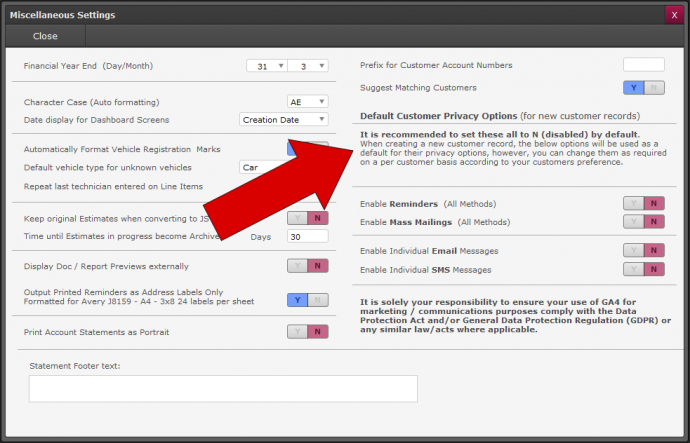 With this option set to N, you will not be able to send any mass mailings (Admin > Mass Mailing) to that customer. You will still be able to add the customer to the list for sending, but they will automatically be skipped and no mailing, using any method, will be sent / produced. 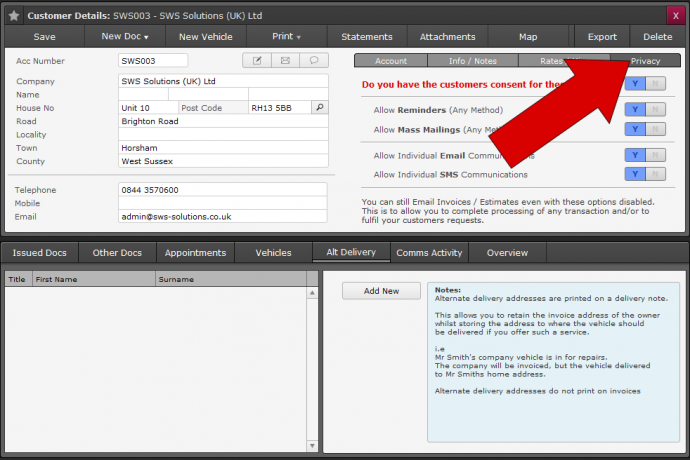 In the same way as Email communications, with this option set to N, if you attempt to send a an SMS message, such as that shows underneath the customer details on a document or the SMS icon next to the account number on the customer profile, you will be restricted from doing so and given a similar notice "The customer privacy options specify that they do not wish to receive SMS messages"
With all privacy options set to No. Even if all options are set to no, you are still able to send the customer Estimates / Invoices via email in order to allow you to fulfil the service you are providing. In addition to the privacy options, you can also save a note against each for internal purposes.